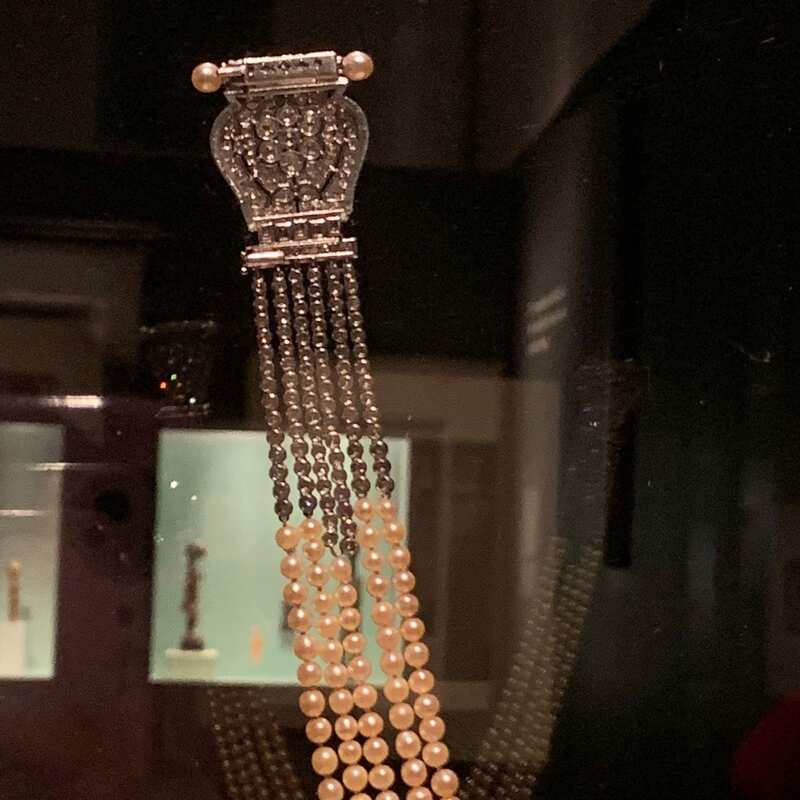 Function – This object, as a necklace, is a decorative jewelry that is created for upper-class women to wear at necessary events. 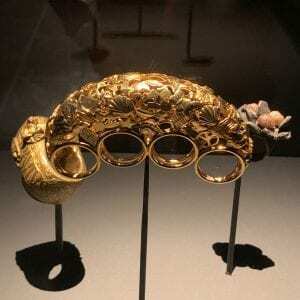 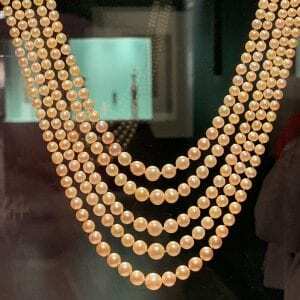 Fabrication – This object is made mainly by golden pearls and diamonds. 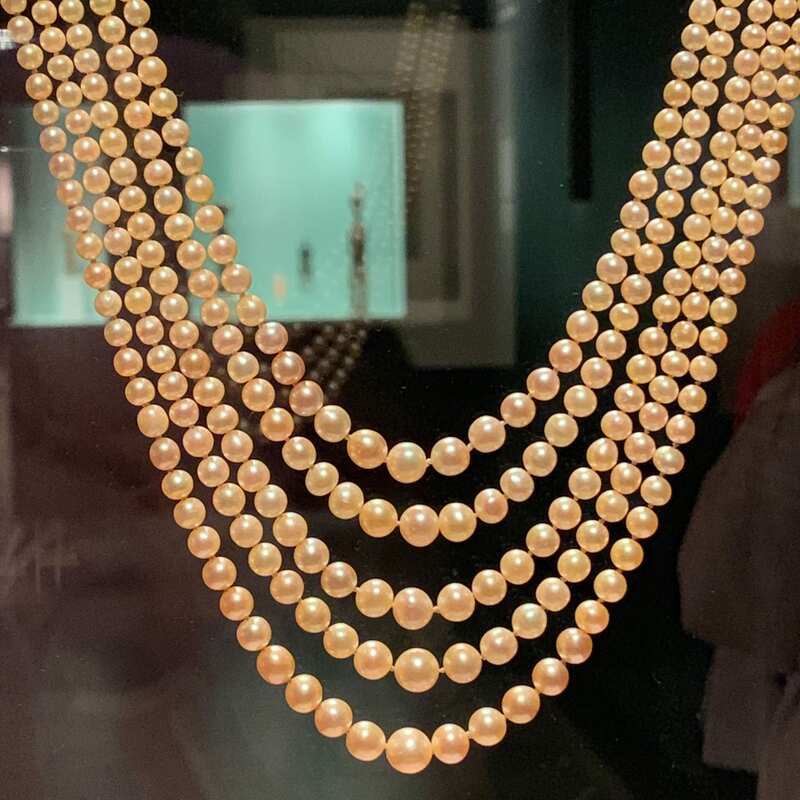 Four circles of pearls built up this necklace, made it extremely elegant and luxurious. 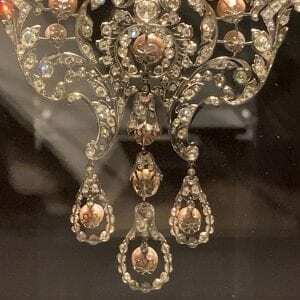 Form – where did this form come from – how did it evolve? 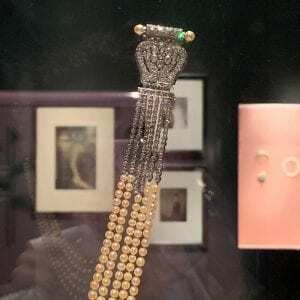 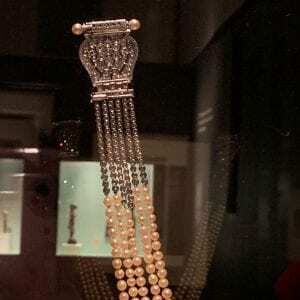 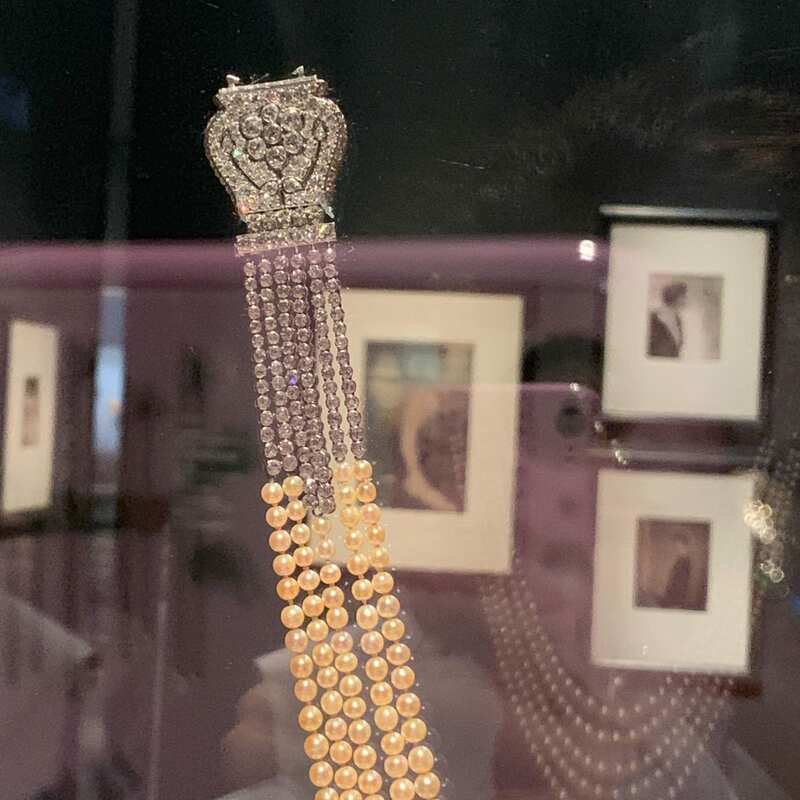 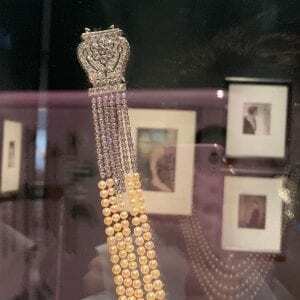 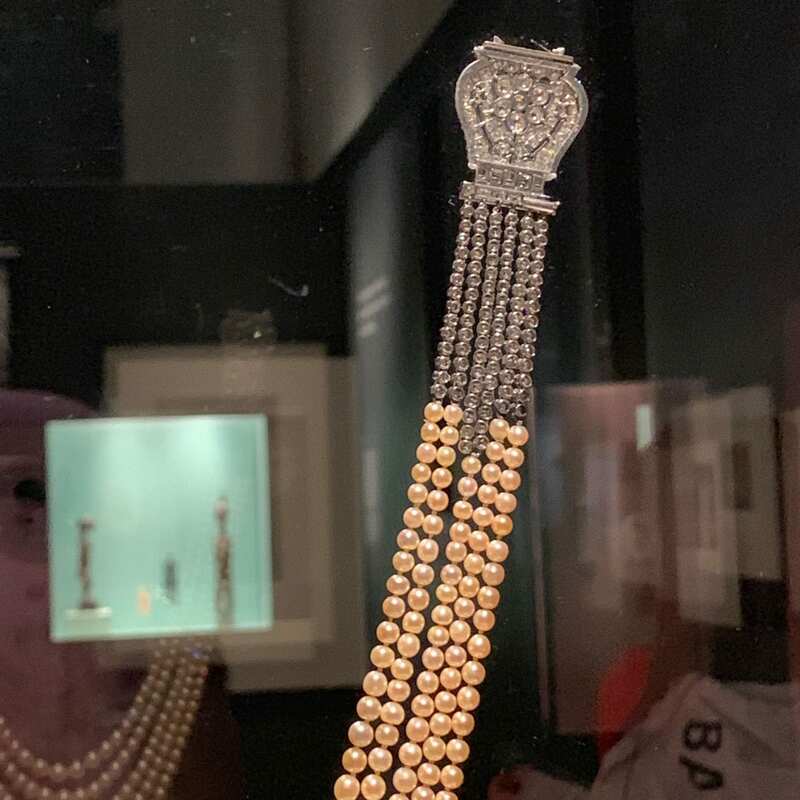 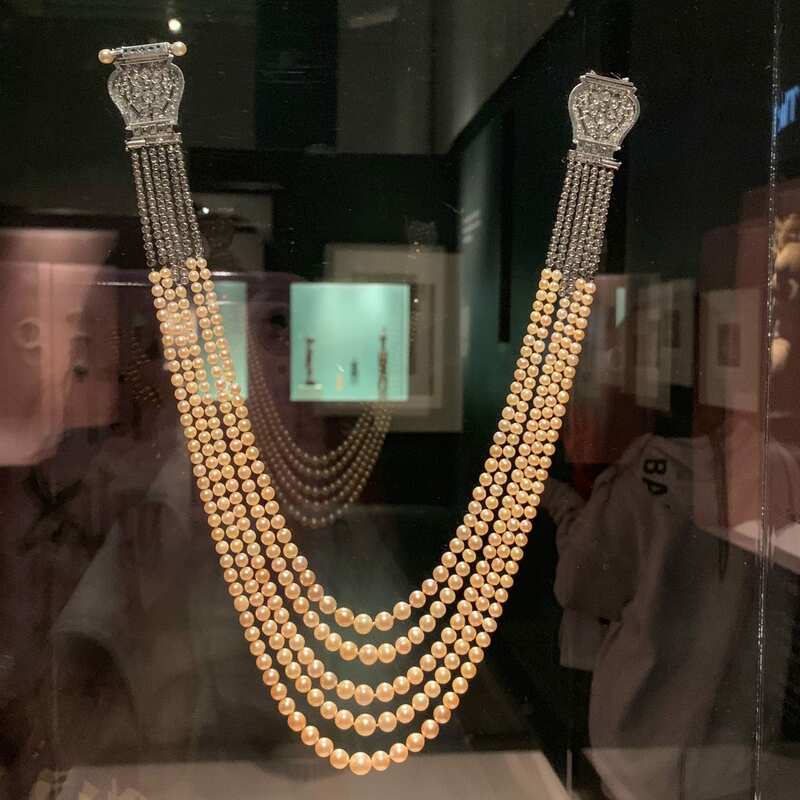 This object, as a necklace,Great amount of pearls are used to build up the necklace, and diamond is used to hold them together as a necklace,is a decorative jewelry that is created for upper-class women to wear at necessary events,is made mainly by golden pearls and diamonds. 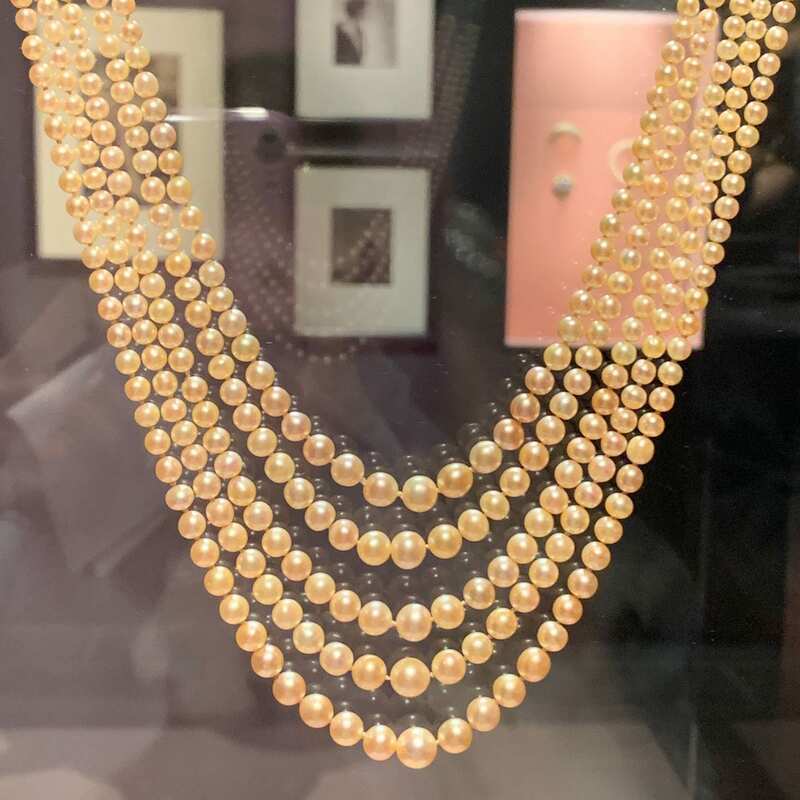 Four circles of pearls built up this necklace, made it extremely elegant and luxurious.This necklace has a sense of luxury and elegance by its materials and composition. 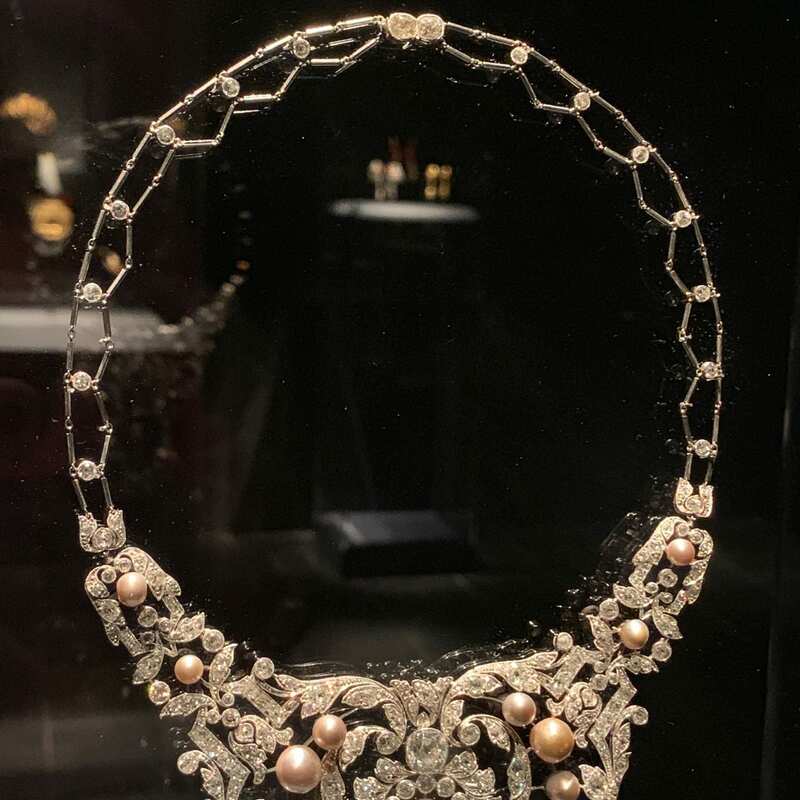 The shape of the diamond part and the amount of pearls all show such beauty of wealth and nobility.The necklace has a smooth texture that shows it has been carefully polished and processed. Its bright surface brings the sense of quality to me.If i redesign it,I would use the same material basically, but I might choose black pearls instead of golden ones, because I like the heaviness black pearls can bring as a piece of jewels,changing the shape of the diamond part, \diamond gets lagrer and occupies more of the whole necklace and adds more brightness to the whole piece since the proportion of golden pearls decrease. 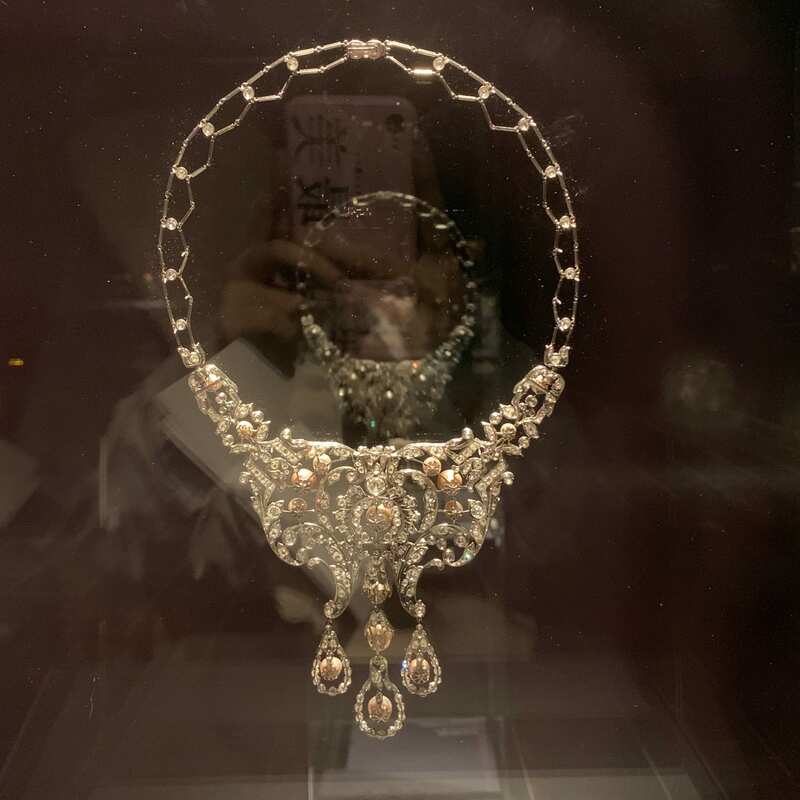 Function – It’s a necklace.Thus, I think it not only functions as a way to enhance the beauty but also shows a level of status.It was designed for wealthy women. Fabrication – It’s made from precious materials like diamonds and pearls. The reason of using diamond and pearls is to to make the necklace more stunning and enhance the beauty but also shows a level of status. 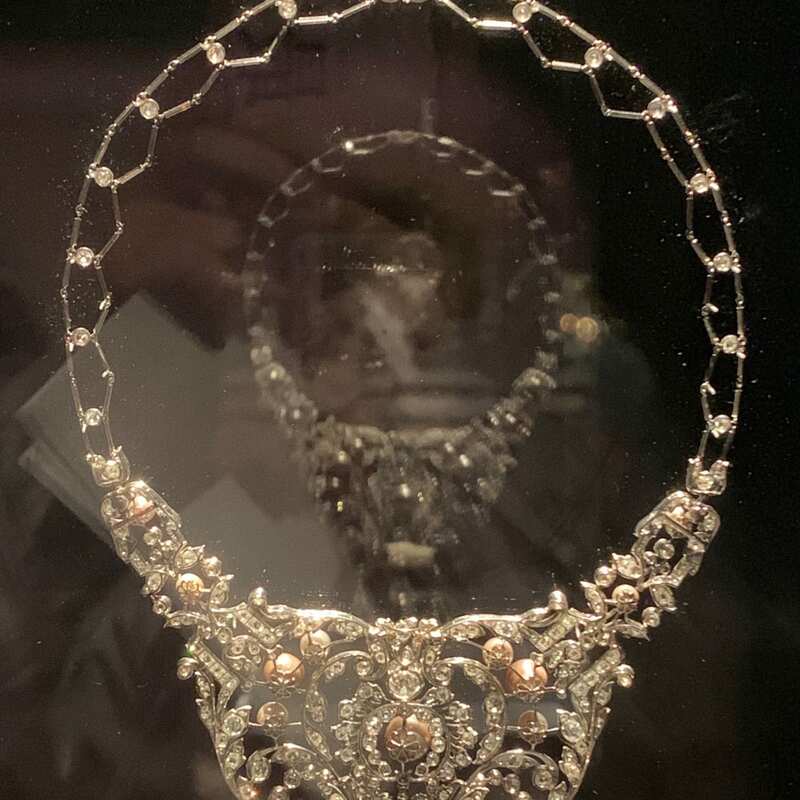 I was attracted by the pattern and different materials that made the necklace.It’s a necklace made from precious materials like diamonds and pearls.while the main part was added with pearls on it, to make the necklace more stunning.Thus, I think it not only functions as a way to enhance the beauty but also shows a level of status.This item was designed for woman who was very rich and in upper class. 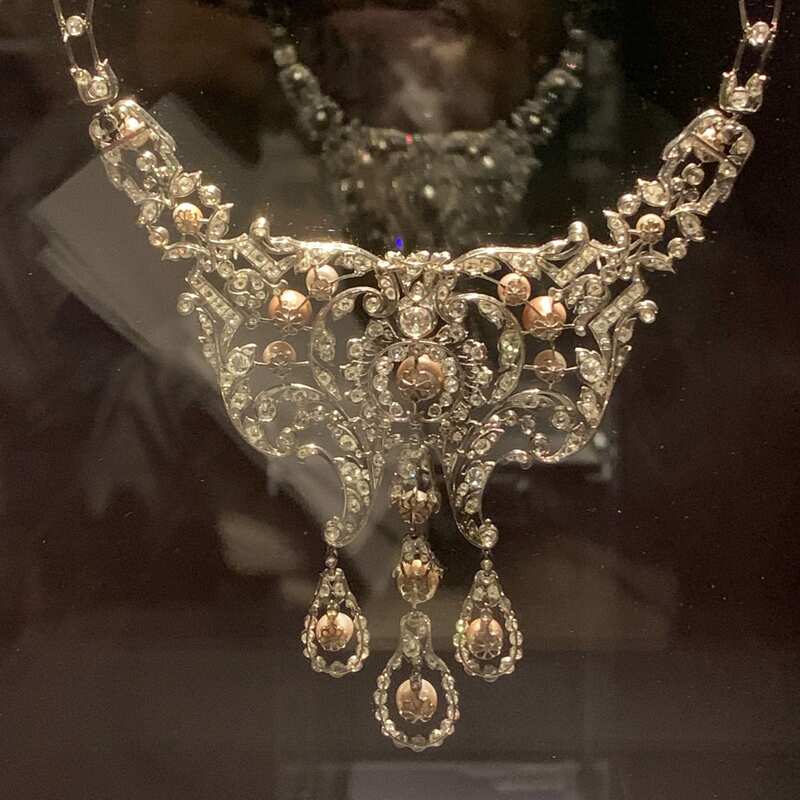 If I could wear it, I would match it with a very elegant garment in dark color, so the contrast of the color can make the necklace more attractive. 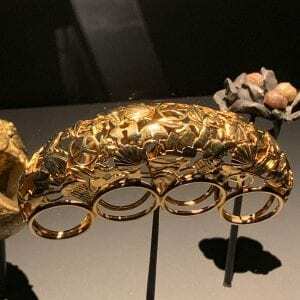 I would feel very proud to wear it. 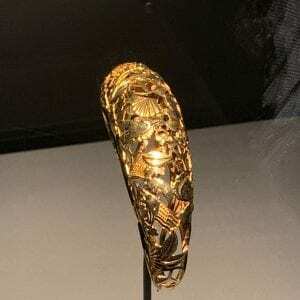 If I lived inside this piece, it would be hard to walk on it. 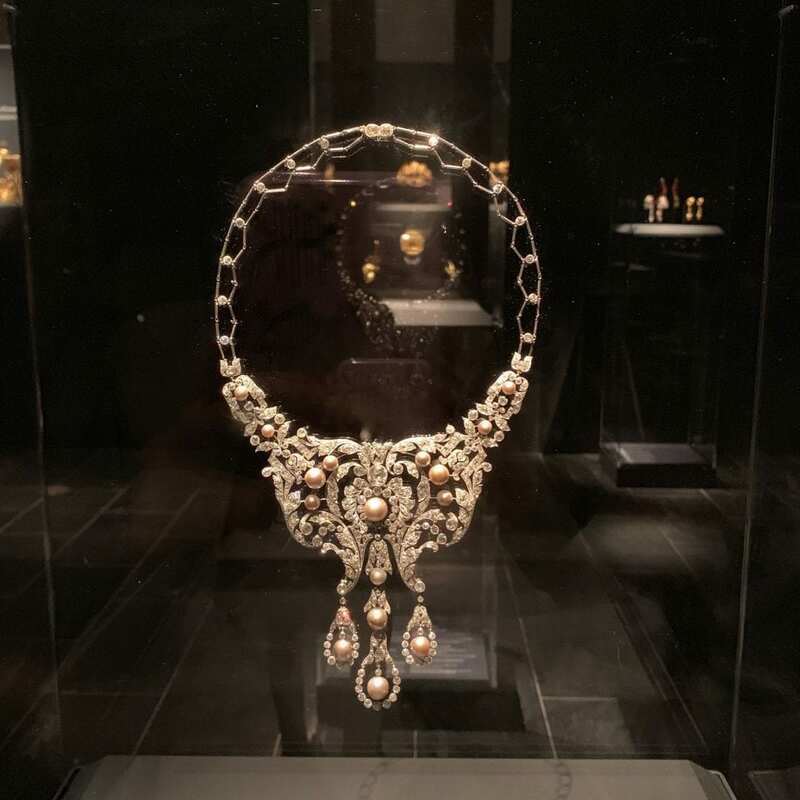 The surface was so rough because of the shape of the diamond. 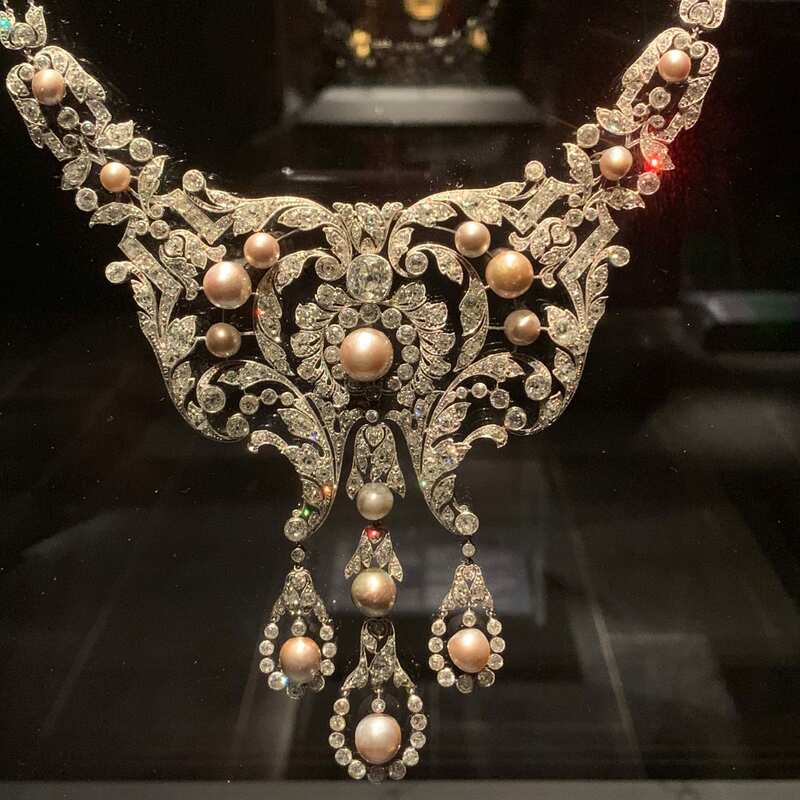 Also, the combination of diamonds and pearls made the jewelry looks more three-dimensional.If i were redesign it,I would use other materials than pearls in order to reduce the weight of the necklace. 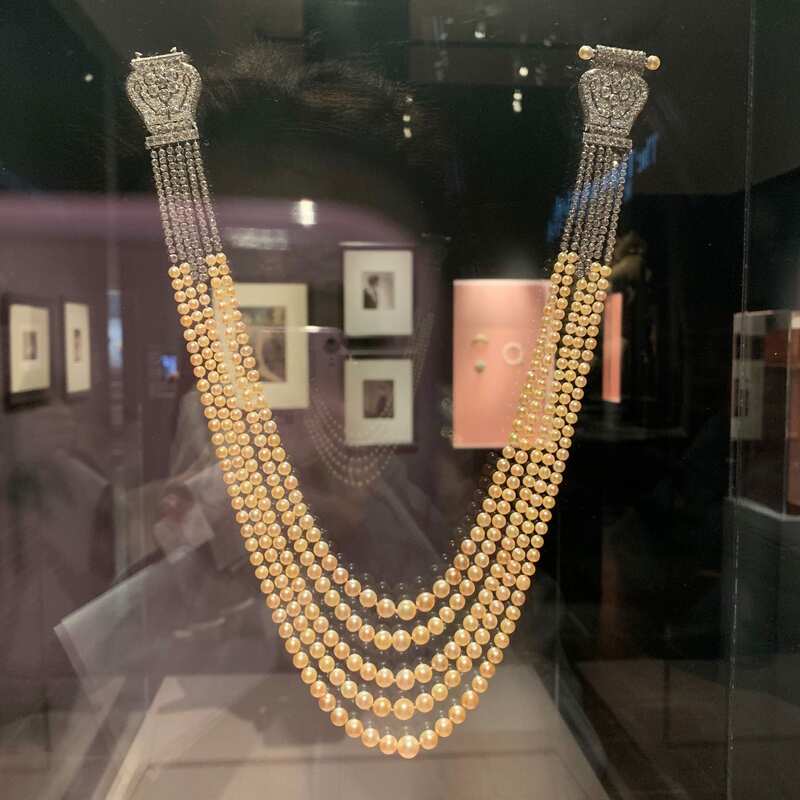 For example, I would reduce the amount of the pearls and replace them with saphire so the color would be balanced too.Imagining this help me explore my mind and think differnetly. I need to brianstorm the other materials in order to maximum the convenience of the item but also maintain the asthetic standard. 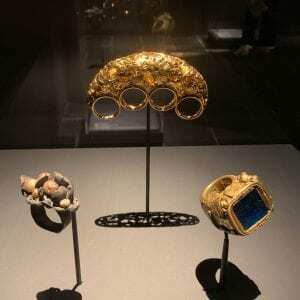 By imaging the change, I am able to combine the different thoughts from ancient times with those people held nowadays. 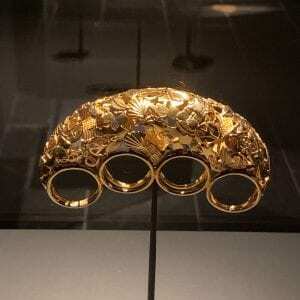 For example, this piece, in ancient times people will focus more on showing how precious it was but I will be thinking about adding more flexibility and fashionable element to it. 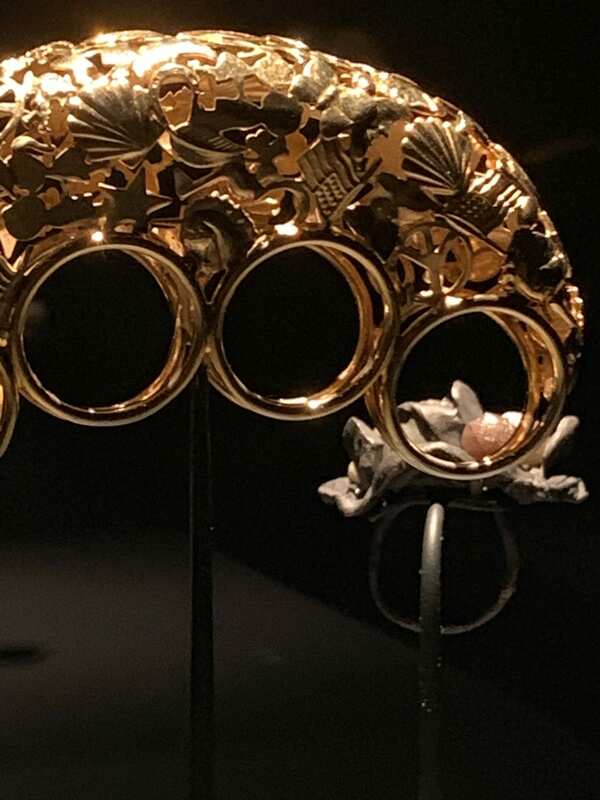 Function – The function of it is to emblem and identity the owner,sight and seal rings,It was designed for the noble people. 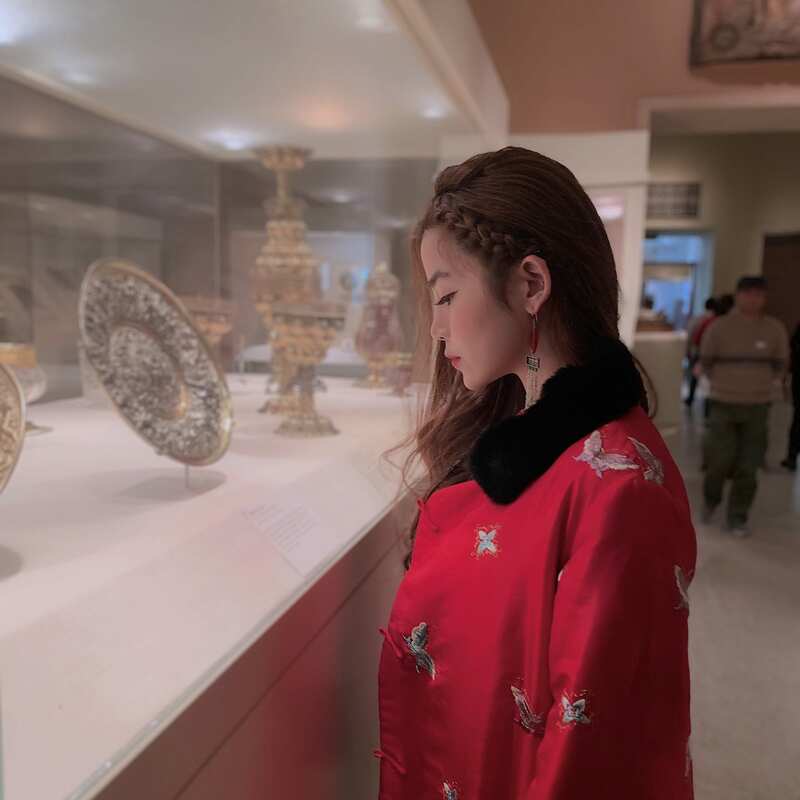 Fabrication –It’s made by melting the brass.The reason used brass is the golden bright gold attract peoples attention and gave sense of vintage. 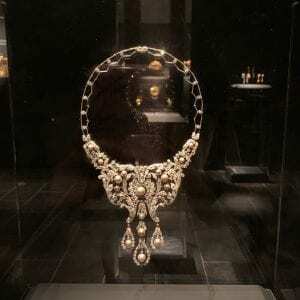 Form – where did this form come from – how did act evolve? 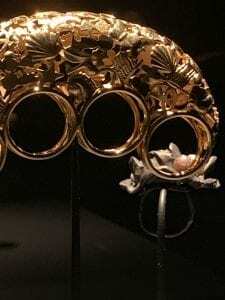 When i saw this object, i first notice about the delicate decoration on it, and its made by brass, i think the function of it is to emblem and identity the owner,sight and seal rings,It was designed for the noble people.if i were wear it,people around mewl think that I’m rich person with high reputation.if i were redesigned it, i would simply the part of decoration because the decoration part was too cumbersome to wear in daily life, i also will changed the structure of item a little bit,by changing the shape of the gold to leaves with silver, I believe the new part i would make the whole piece more elegant and organic. 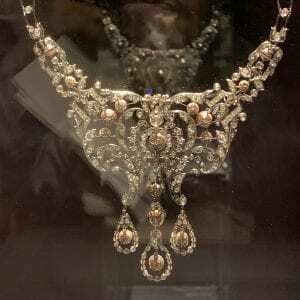 Compare Necklace with diamond and pearls and Tiffany yellow diamond. 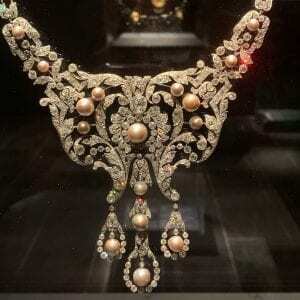 Necklace with diamond and pearls were made of diamond and pearls. 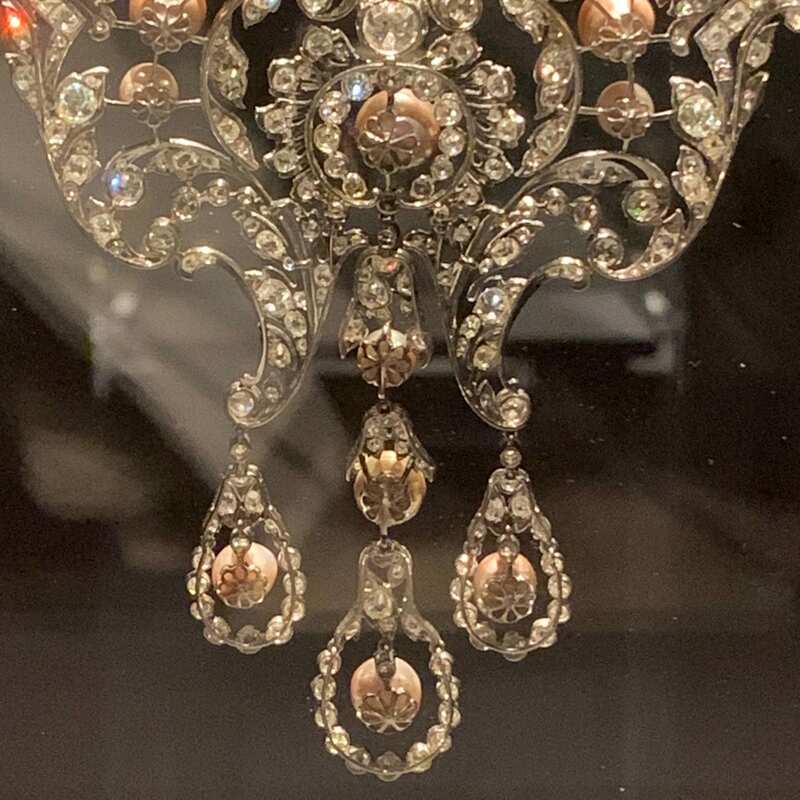 The materials are expensive but the exquisite techniques of the designer were even more attractive and amazing. 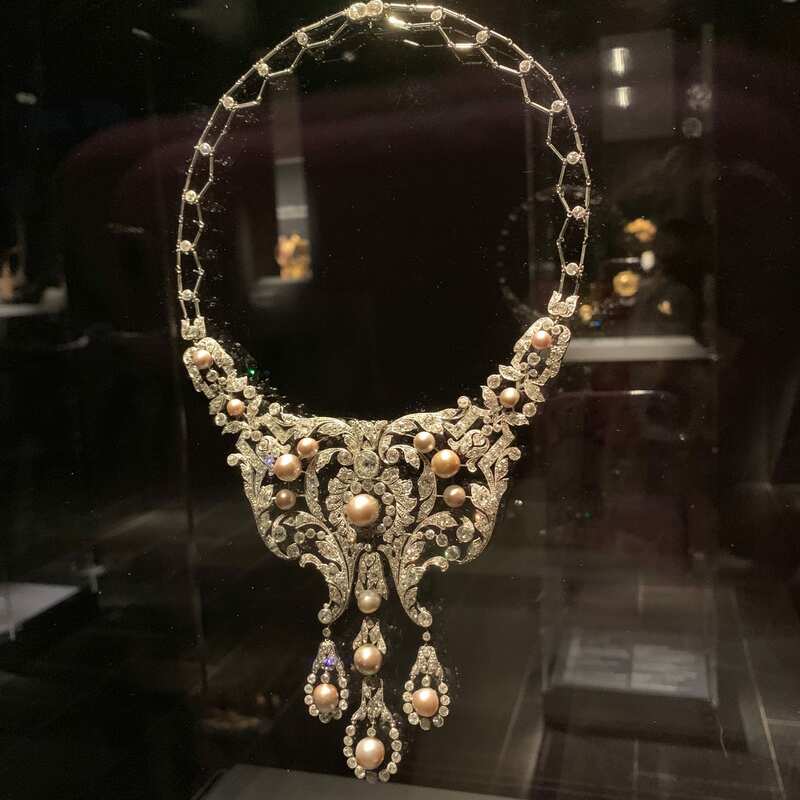 It’s a very complex piece that contains many diamonds and pearls. 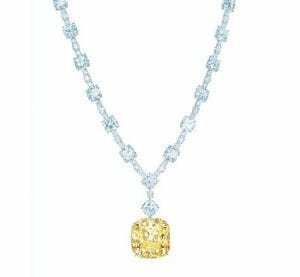 On the other hand, Tiffany yellow diamond looks simpler. It contains several diamonds and a huge yellow diamond in the center. 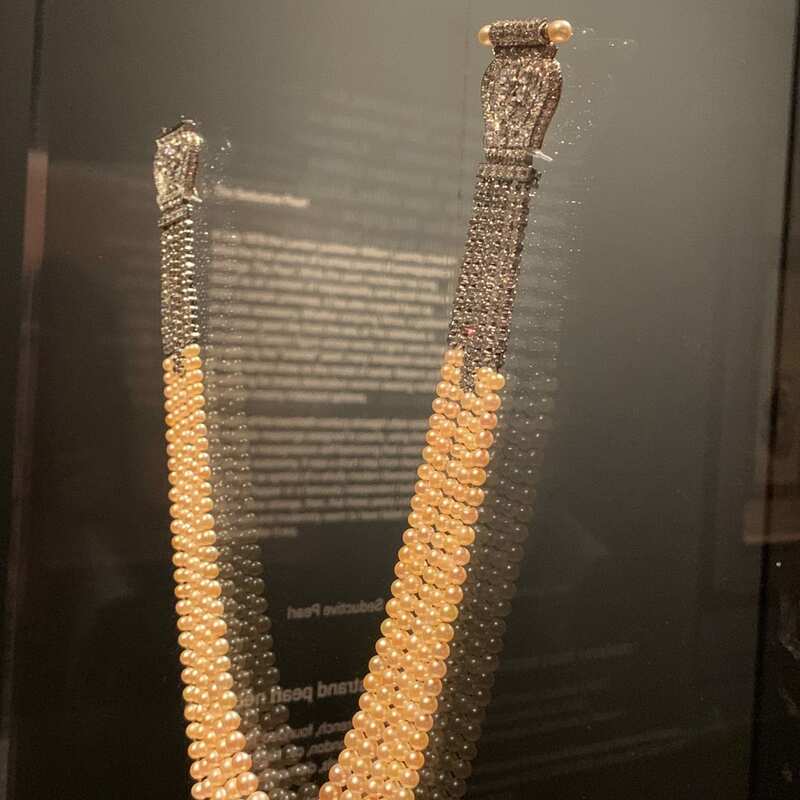 Although the cutting skills of the yellow diamond is amazing, the value of the yellow diamond itself is more fascinating. 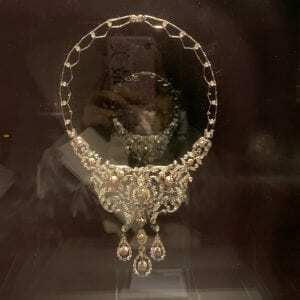 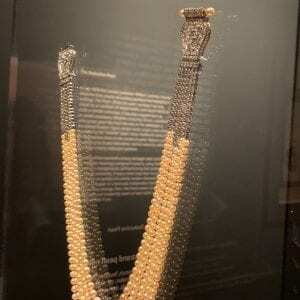 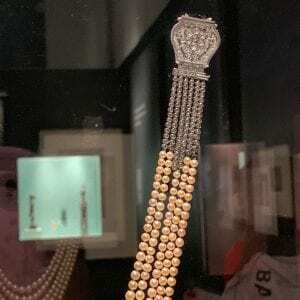 This necklace is considered one of the most expensive necklace in the world. I believe the simple design of this necklace is aim for the emphasizing of the yellow diamond.